And I’m back with another holiday gift guide- this time for Harry Potter fans! I have been a long-time fan of Harry Potter and the wizarding world, so I have a huge appreciation for any magical decor and designs. I also love how small business owners and artists have gotten creative to show some love for this series too. Here are my top 7 favorite gifts you can give to any Potterhead this holiday season! 1. HPA Mugs! The Harry Potter Alliance is always doing great things when it comes to supporting Harry Potter, activism and making the world a better place. By buying merch from their shop, all the funds go straight back into the non-profit to help cool projects like building libraries or running campaigns for literacy, human rights and much more. 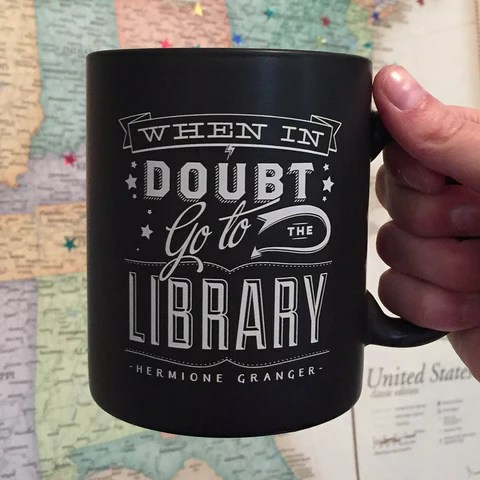 You can’t go wrong with a When in Doubt, Go to the Library mug. Or what about the Books Turn Wizards in Muggles mug? You can put anything in these, from tea to coffee to juice (and alcohol). 2. Butterbeer Soap! 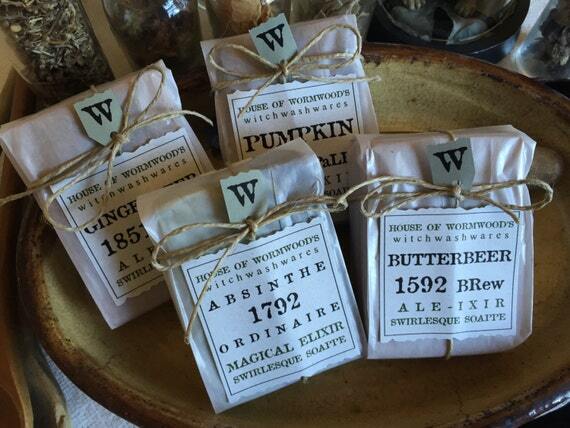 The House of Wormwood makes wonderful soaps, like this Butterbeer soap. It smells like Butterbeer but it’s not too strong. It lathers up nicely and doesn’t leave the residue like most soaps do, so you’ll feel nice and clean. My boyfriend actually approves of this soap, and that is saying a lot coming from him (since he usually doesn’t care about skin products). Make sure to check out the House of Wormwood’s other Harry Potter-related soaps too (she has some pretty fun references!). 3. Potion Necklaces (or ornaments)! Miniature potions in any shape or form are really cool. There are so many options and interpretations for the many potions that exist in the wizarding world. 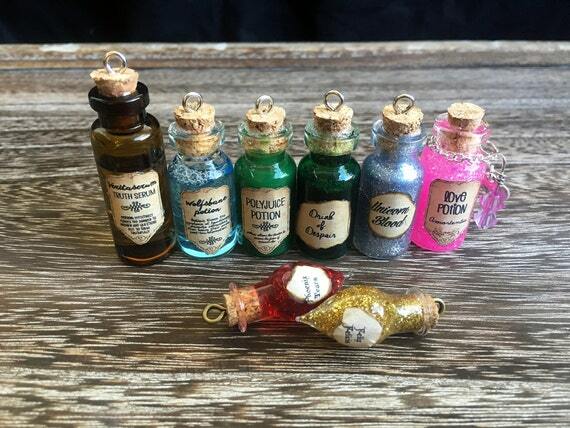 TayPop does an excellent job of recreating our favourite potions with these Harry Potter potion necklaces. You can choose from 19 different potions as well as necklace chains or cords. This is great customizable gift for any Harry Potter fan (or maybe for yourself). 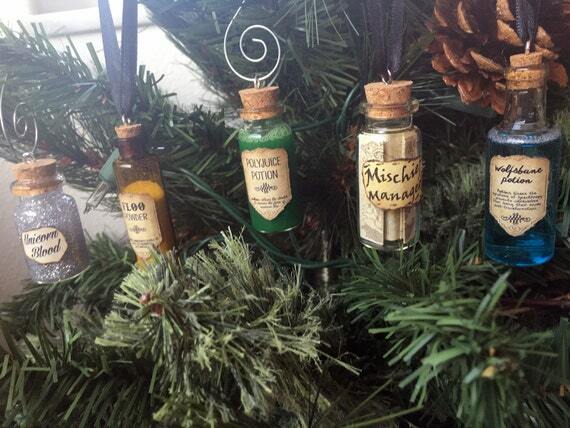 If you’re not keen on wearing your potion, you can always consider potions ornaments to bring out some geeky decor for the holidays (and these aren’t just for Christmas trees either). 4. Hogwarts House Banners! Dariti Designs has so much love for Hogwarts. 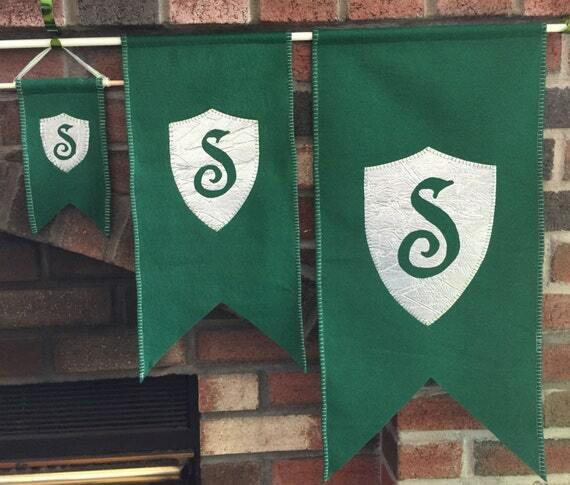 She shows house pride with these Hogwarts banners, which add a great touch for home decor. Since I’ve retaken the Pottermore quiz a while back and the Sorting Hat declared I have a wee bit more Slytherin than Gryffindor in me, I’ve been very fond of this medium sized Slytherin banner. Banners come in 3 different sizes (mini, small and medium) AND they come in different variations (with the house letter or the house animal and with/without a crest. While she’s booked for custom orders this holiday season, she does have some ready-to-ship banners looking for new homes! 5. Wands (premade or custom)! OrchardWorks has a great selection of wands if you’re looking for one for a family member or friend. They offer simple designs as well as some more complex ones. They have a lot of woods to choose from, and they do have some Harry Potter replica-inspired design. I love how their Luna Lovegood wand turned out! Most wands are made-to-order, so I would message the owners to see what their turnaround time is (since they might be slammed with requests). I’ve ordered a custom Pottermore wand during the summer convention season and was able to get my wand created and shipped to me within a week. They’re very responsive and can work with you to make whatever you would like and to get it to you on time. Just give them as much detail as possible so they can expedite your request! 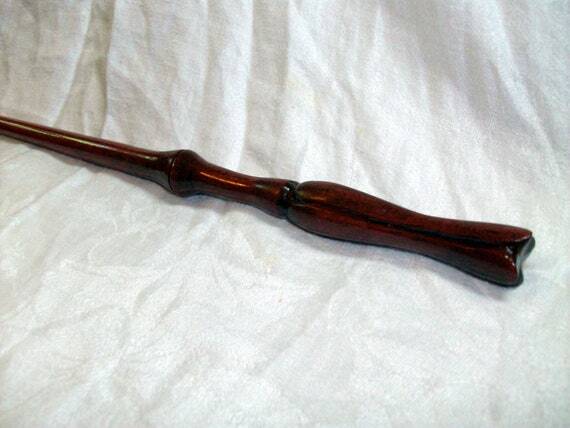 And unlike the resin wands, having a wood wand is more lightweight and natural-feeling. 6. Sorcerer Socks and Sleeves! These Sorcerer Socks by Sock Dreams are fun enough to show off your house pride! They come in all the house colors and are made of nylon and lycra. Each pair are approximately knee-high, about 16 inches from heel to top and fit women’s shoe sizes 6-9. If you’re not crazy about the socks, the Sorcerer Sleeves are a great alternative to consider. Great to wear on a cold day or just for fun. They’re open at the hands so you can still do what you need to do (like spellwork or chores around the Burrow). 7. Magical Notebooks and Planners! You can never have enough notebooks if you want to write stories, jot down ideas or make checklists for yourself. Celestefrittata Bottega Online has some stylish notebooks for on-the-go. You can choose from a notebook option with blank pages, or a planner option with daily or weekly pages. Planner pages are all set for the 2016, so this option is perfect for those who want to get better at being organized. Covers are based on Hogwarts topics. 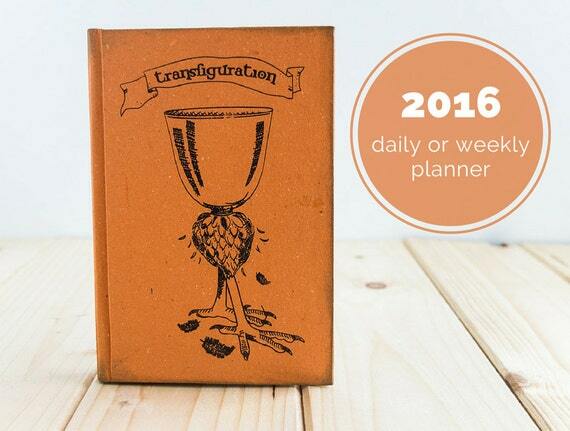 I particularly love this Transfiguration notebook or planner…the cover suits the subject very well. Hermione would approve. As an extra 8th gift idea for a Potterhead, I am also offering my own Harry Potter Holiday Gift Bundle in my Etsy shop! 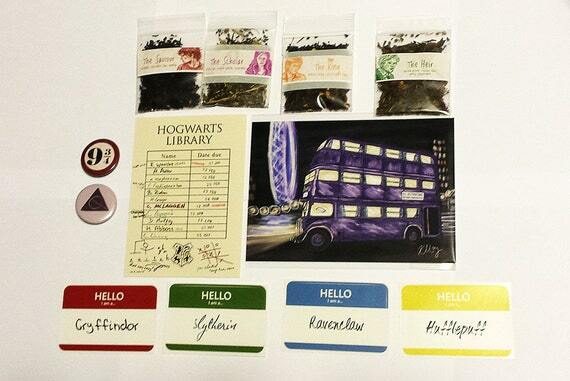 This limited time bundle includes a print, tea samples, buttons, name tag stickers and a postcard. They can easily serve as a great stocking stuffers because of the small size of these items. I will be offering this bundle for the rest of the month, so there’s plenty of time to snag one! And that’s a wrap! My next holiday gift guide will cover SuperWhoLock (Supernatural, Doctor Who and Sherlock). Stay tuned for more!